General Motors has said it wants to deploy a fleet of self-driving Chevy Bolts for a commercial ride-sharing service at some point in 2019. But ahead of that, GM’s self-driving unit, GM Cruise, is aiming to deploy autonomous cars without a driver at the wheel as part of a pilot program in San Francisco that, emails obtained by Jalopnik suggest, could launch imminently. “I am happy to discuss the details of the exercise and why it’s critical to our forthcoming public launch and law enforcement interaction plan requirements,” Nadia Marquez, GM Cruise’s senior government relations manager, wrote in a May 2 email, obtained by Jalopnik through a public records request. It’s unclear how soon Cruise plans to launch the pilot, but multiple emails suggest the goal is to deploy in the near-future. A spokesperson for the mayor’s office didn’t respond to a request for comment. Notably, last November, GM President Dan Ammann gave the impression the company wasn’t interested in launching pilot projects for driverless cars. Cruise wouldn’t comment on the prospect of a driverless pilot in San Francisco. California recently unveiled a new system that requires companies to obtain a permit to test driverless cars in the state. Only two companies—not including GM Cruise—have applied to date, the California DMV confirmed Tuesday. One key aspect Cruise officials described as crucial to a successful launch is training its autonomous cars to properly respond to emergency vehicles. Cruise requested one-to-two officers and a fire truck, a fire engine, and an ambulance to drive around the permitted area with lights flashing, Bunting said. But the fire department had apparently determined it wouldn’t be a prudent use of resources, which set off a series of discussions between Cruise, the mayor’s office and the fire department that spanned several weeks. “While it has been a pleasure to support you and your projects and/or events, this practice is not proving to be in our best interest,” Mindy Talmadge, administrative officer of the fire department, told Cruise in an April 18 email. By early May, Cruise had yet to make headway on the request. In a May 2 email, Andres Power, an advisor to the mayor, told Cruise to check with Commander Teresa Ewins, of the San Francisco police department, for a status update on the training exercise. “I’d ask that you reach out to the fire dept to make sure they are not pulling the same,” Ewins added. Ewins, inadvertently, had copied Cruise’s Marquez on the email. “If it is the Department’s desire to fully deny collaboration on the Law Enforcement Interaction Plan and any safety relating exercises, please let us know, so that we can limit work to the DMV/[California Highway Patrol] on finalizing our submission,” Marquez added. “This is far from ideal, but I do want to support your wishes. Launching its first driverless car pilot in San Francisco makes sense for Cruise. The company has been testing self-driving car in the city with safety operators at the wheel over the last few years, and last fall it launched an autonomous ride-hailing service for employees called Cruise Anywhere. The testing in San Francisco hasn’t been without hiccups, however. The California DMV has reported 42 crashes involving autonomous cars in the city since the beginning of 2017. 33 included Cruise vehicles, but none found the company at fault. A motorcyclist rebuffed the narrative of one accident, after he sued General Motors for negligence over a December 2017 crash in which he alleged one of the automaker’s autonomous Chevy Bolts had knocked him off his bike. Last Wednesday, both sides agreed to settle the case, Jalopnik first reported. GM moved into 2018 with the announcement that it intended to deploy autonomous Bolts with no driver or steering wheel by 2019, pending regulatory approval. It planned to deploy self-driving cars for testing in Manhattan by “early 2018,” but the company has yet to secure a permit to begin driving in New York, Jalopnik recently reported. 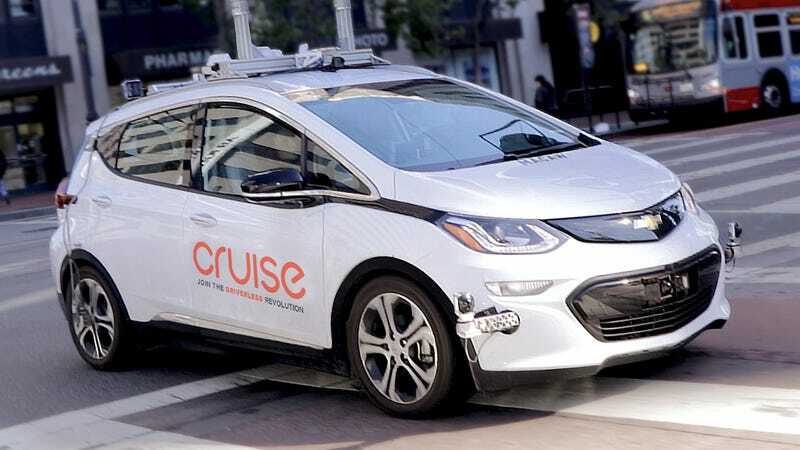 If Cruise deploys a driverless car pilot this year, it would join its main competitor, Google’s self-driving car unit Waymo, which plans to launch a driverless taxi service later this year. GM Cruise announced a deal last week with tech investment firm SoftBank, which said it would invest $2.25 billion in Cruise. It’s unclear if the training exercise Cruise sought to organize in San Francisco has yet to be completed. A spokesperson for the police department told Jalopnik: At this time SFPD has not participated in exercises involving AV’s. The Mayors office is working with the City Attorney to work out a system for requests. We want to be fair to all companies and provide the same information. On May 23, Katie Angotti, director of state and federal legislative affairs for the mayor’s office, asked Cruise if it was “interested in providing our first responders with a safety briefing to discuss any toxic or dangerous materials they should be aware” of.